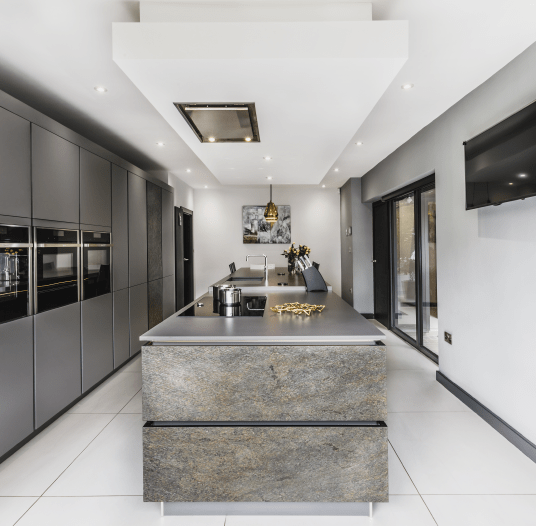 When a couple moved in to their dream house in Bolton, one of the first things they wanted to change was the dated kitchen. 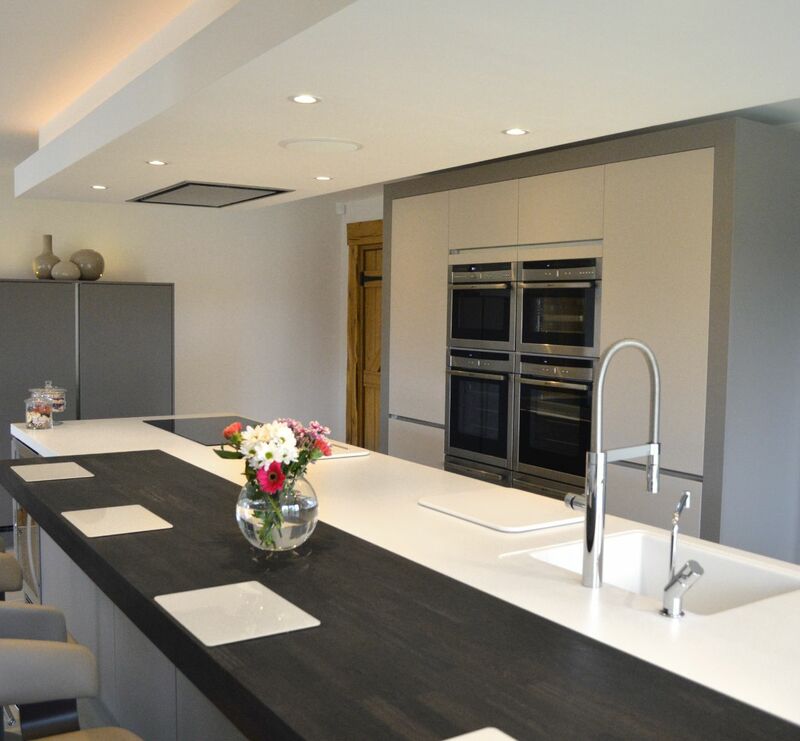 Keen to ensure the style of the new kitchen was in keeping with the rest of the house, they contacted three kitchen companies with a view to getting designs and prices for a contemporary white kitchen. 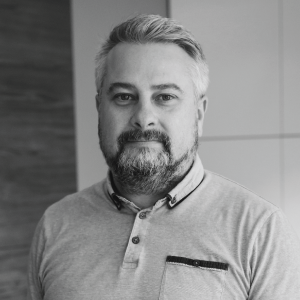 It was Paul Harrington and Kitchen Design Centre that led the way in terms of price and design. 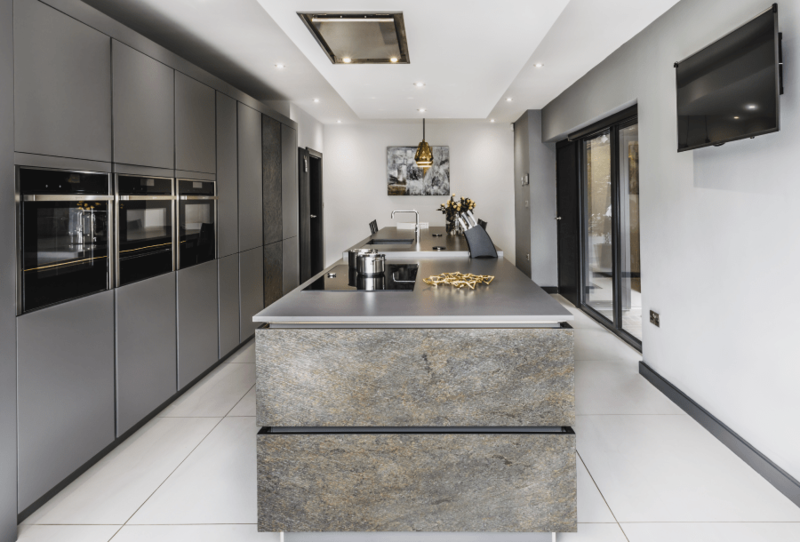 “Kitchen Design Centre’s designs were by far the best and the price was a nice surprise too, coming in cheaper than the other companies.” Initially the couple had their heart set on a white kitchen but this all changed when they visited the showroom and fell in love with a dark style display that incorporated a stunning textured feature cupboard. 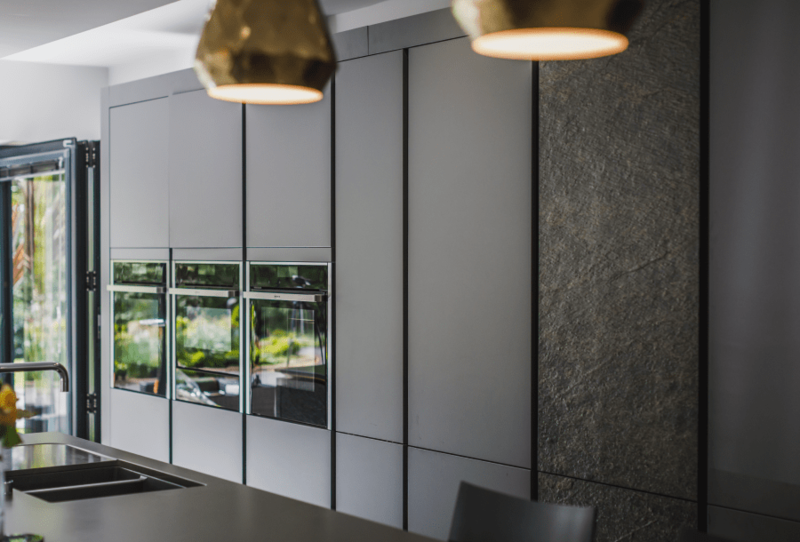 Paul incorporated the textured unit in to one tall wall cupboard for contrast and on all the lower island units. 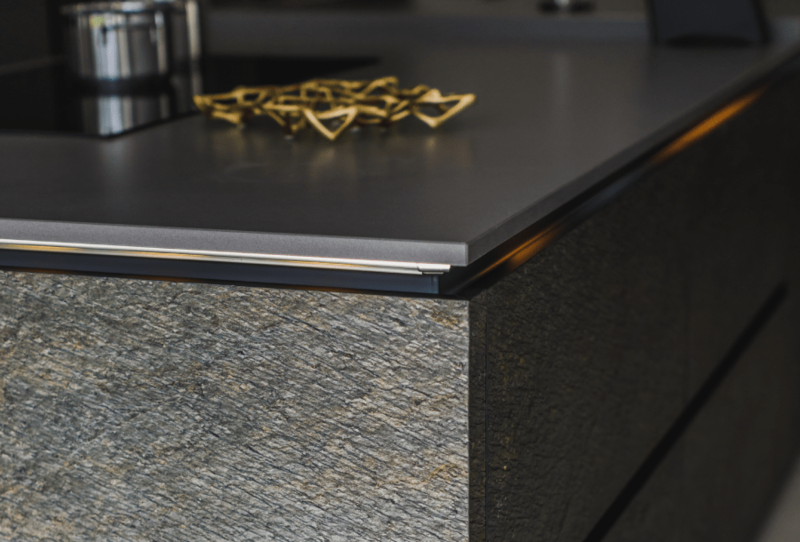 Handle trim lighting on the edges of the island underneath the granite made it really stand out. 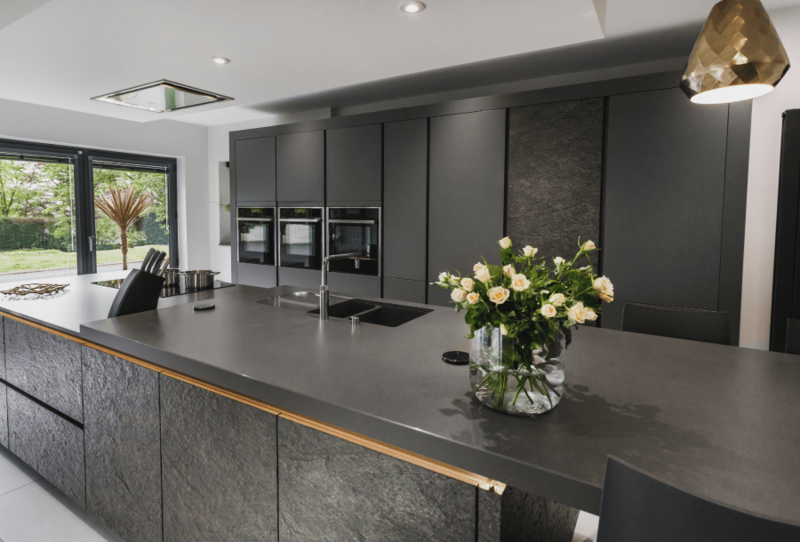 To complement the dark tones of the kitchen, a Silestone Cemento Spa worktop in a suede finish was chosen. 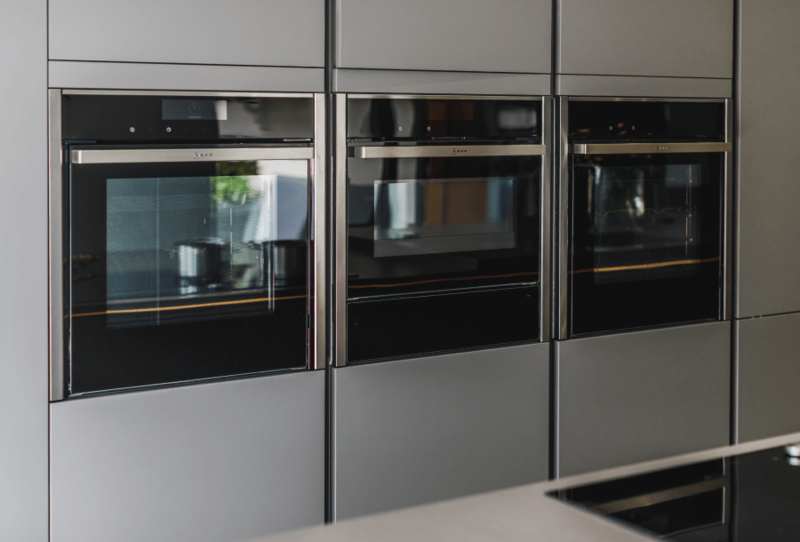 The couple loved the way Paul advised them on appliances and chose two Neff ovens, both premium touch screen ovens: one slide and hide and the other a compact oven with microwave. 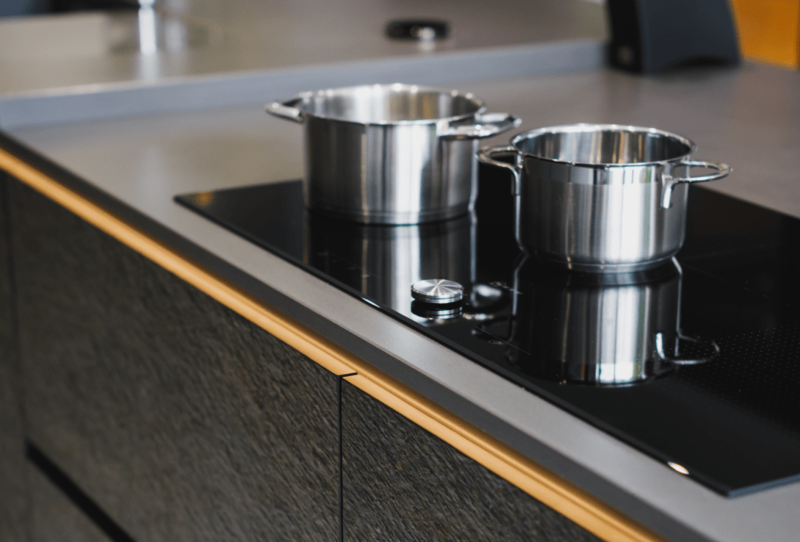 This accompanied their Neff induction hob. 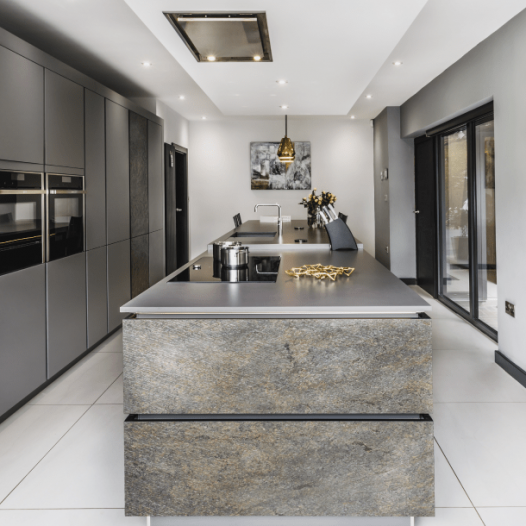 In addition to this, two fully integrated built in fridge freezers were installed side by side to create the American fridge freezer type effect when opened. 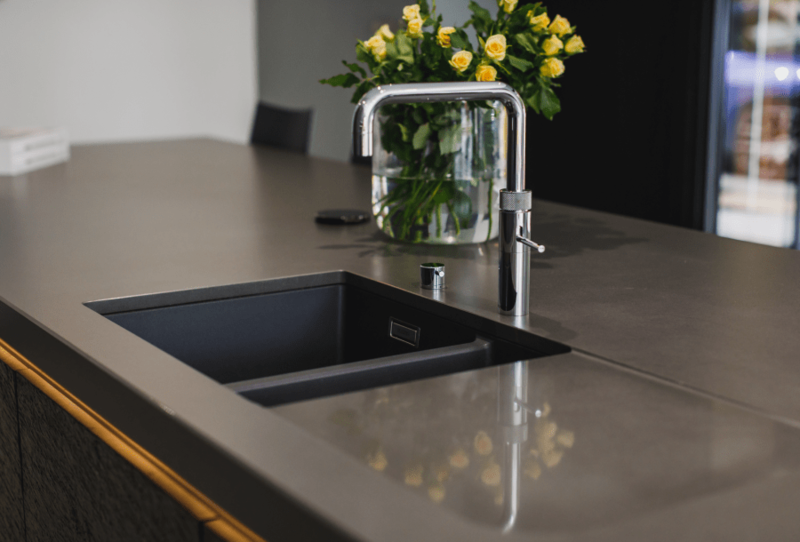 A 3-in-1 Quooker tap which the couple absolutely love was also selected. 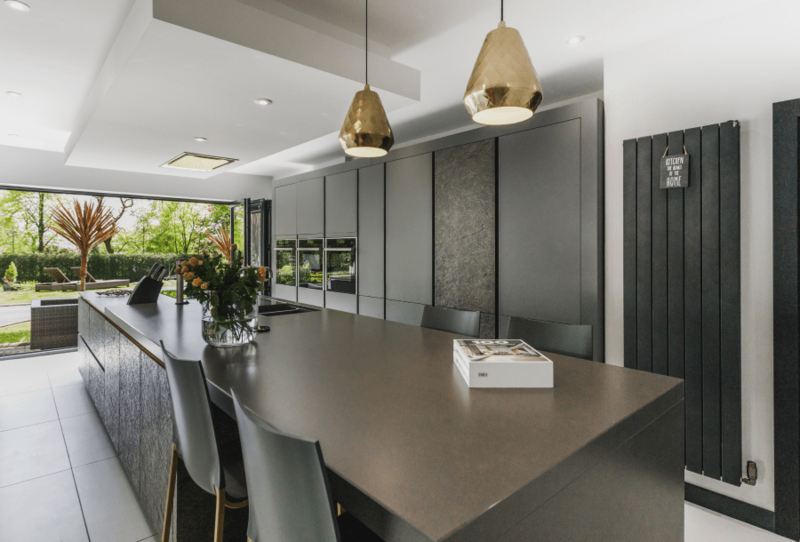 "The textured cupboard matched our parquet flooring in the hall perfectly and it added a whole new element to the kitchen. From that moment I had my heart set on it." 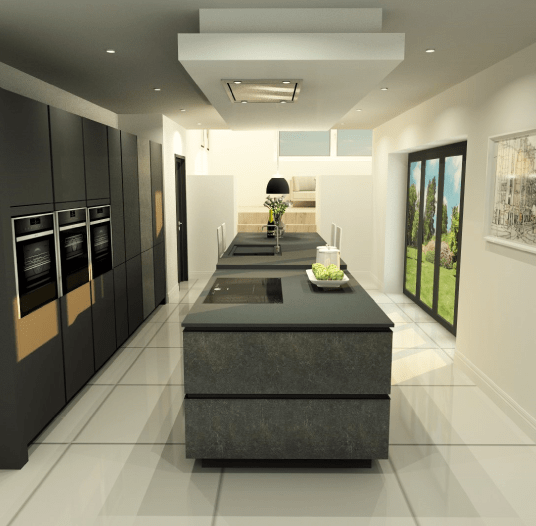 "t was great to design a kitchen in dark colours. A monochrome look always stands out and this looks fantastic. 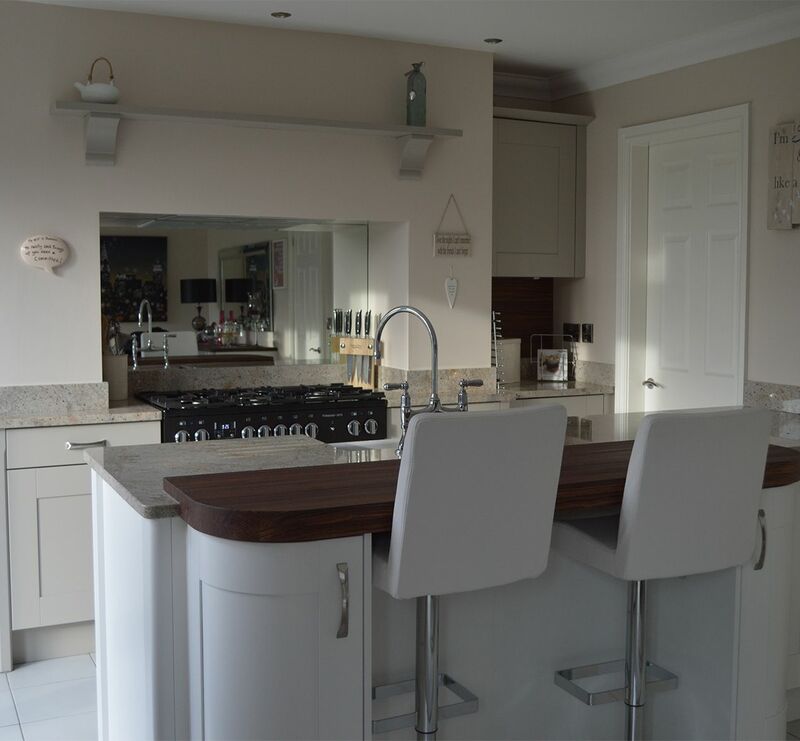 I’m delighted with the finished look as it certainly has the ‘wow’ factor. The space was quite a difficult one being long and thin with limited wall space. It meant the island and wall units had to have special consideration. I made sure there were defined areas for cooking and eating on the island/breakfast bar and created difference by raising the level of the breakfast bar end. The granite is 40 cm thicker than the rest of the island here. I was really happy the couple went for the textured doors in gold green too. 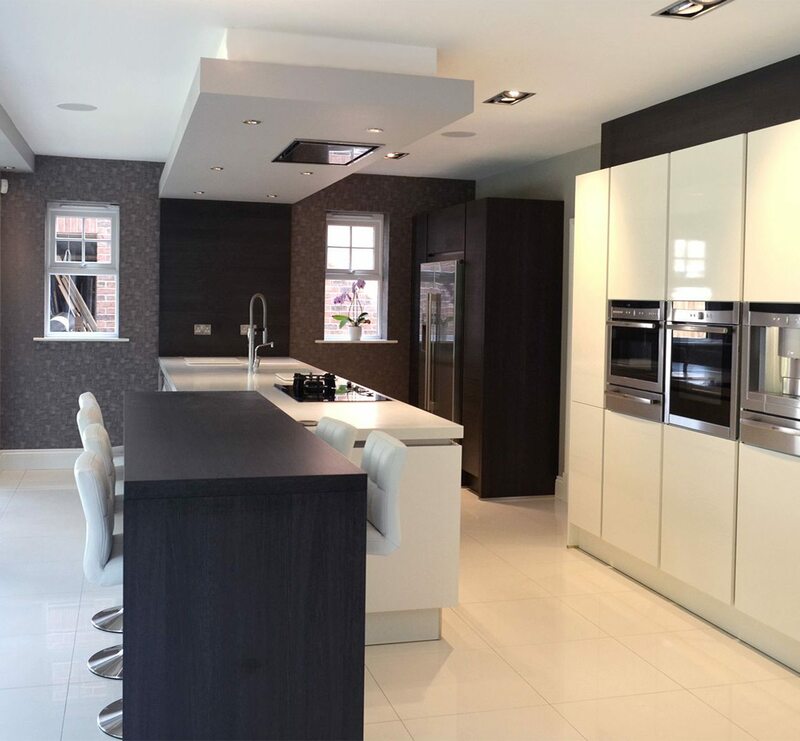 These created a real contrast and point of difference in the kitchen; particularly the solo feature wall cupboard."